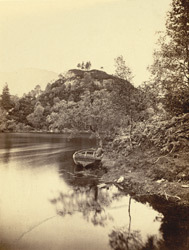 "The point from which this view is taken is situated about sixty yards north of the Trossachs Pier, and gives a different view of the same little bay from which the steamer departs. It is from this point that the pleasure boats, rowed by hardy Highlanders, start for the Goblin's Cave and Ellen's Isle. The cave is situated on a rocky platform, a considerable way up the brow of Ben Venue, which is seen rising beyond the birch-clad promontory in the middle distance. The Cave is formed by an accumulation of rifted rocks scattered about in wild disorder. Like castle girdled with its meat.'"